For wine enthusiasts, a great bottle of wine is the perfect way to help a newlywed couple celebrate this new chapter in their lives. They can pop open the bottle during their honeymoon or cellar it for a later occasion – and toast to what great gift-giving friends they have! With so many different types of wines, all with unique flavors, there are several amazing choices out there for a bridal shower, bachelor/bachelorette or wedding gift. When you’re looking for the perfect wedding gift wine to give, there are a few things to keep in mind. If they love wine and have a fine palate, they’ll appreciate an exclusive bottle. If they’re more casual drinkers, it’s better to pick something that’s widely enjoyed. The most important thing to remember is to get something the couple will like. Even if you love a certain wine, they may not enjoy it as much. If you know they love white wine, get them a nice bottle they may not typically splurge on. For an extra fun touch, include a tag on the wine bottle (or even better, case of wine!) with a personal note from you, as well as a suggested time to enjoy it, or why it reminds you of them as a couple. Maybe you went on a trip together in Spain and you know their favorite Spanish Red, or they love Lord of the Rings, in which case a wine from New Zealand would be perfect. 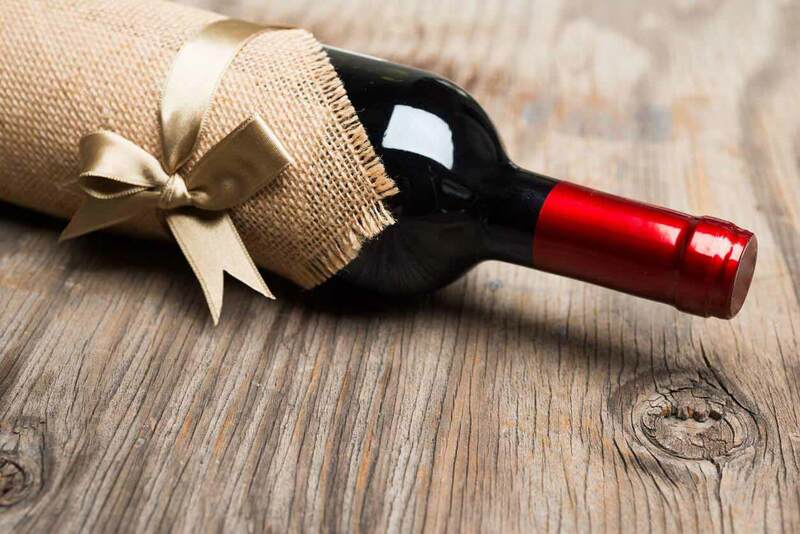 In addition, if you choose a wine that ages well, it makes for a great gift that they can open later for a specific wedding anniversary especially if you include an “ideal to drink by” date with the year of the wedding anniversary. We promise it will taste much better than frozen wedding cake. We can even help you find the perfect wine if you know the amount you want to spend and the anniversary you want the couple to enjoy it on. Bordeaux in particular is ideal for an anniversary wine since it ages so well. We’ve even had customers pick out a case of the same wine from the same year as a wedding gift and then open a bottle each time you visit (or each year) with the couple as a fun way to toast to their wedding, and celebrate your friendship. If you’ve ever wanted to try a vertical wine tasting, this is a great way to do something similar since you’ll be able to taste how it ages each year. This champagne is a popular choice for celebrations, especially weddings. It’s beautifully designed bottle with symbols of the Belle Epoque makes it perfect for gift giving. With a 95 point rating from Wine Enthusiast, it’s on the pricey side but is perfect if you want to get the couple something they wouldn’t normally buy for themselves. Another sparkling wine that is popular for celebrations. This 90 point brut comes from the Champagne region of France and has a delicious, complex taste. This rich wine has many flavors, including red fruits. This is a more economical buy and ideal if you would like to send a case of wine. This riesling has a fresh, zingy taste. Once you take a sip, mandarin orange will be the dominant flavor, but it ends with hints of red apple. This riesling comes from France, a great region for wines. This type of white wine has a higher acidity compared to other varieties, which makes it a perfect cellar wine. This medium-bodied red was bottled in 2015 in France. A grange wine is a popular choice for wedding gifts. This variety also has a longer longevity compared to other wines. The couple can store it and open it at a later date, like celebrating an anniversary. This wine has a lovely black fruit taste that will dominate your palate. This Barolo was bottled in Italy in 2013. It is a delicious red wine with complex flavors. You’ll pick out fruity flavors, like spicy cherry and berries, as well as a number of other flavors, like leather. It has a bright flavor and a firm structure. A port is a much sweeter wine compared to most other types. It is commonly enjoyed as a dessert wine. This port, bottled in Portugal in 2011, has a deliciously fruity body. You’ll be able to pick out raspberry, dark cherry and currant. Later on, you’ll find hints of mocha and pepper with a strong finish. This wine is meant for the cellar — it will be at its best from 2030 to 2050. Browse our extensive selection of wines today to pick out the right wine for a wedding gift. Even better, you can buy online and have it delivered directly to the happy couple. Also check out our wines that are available for free shipping on 6 or more bottles, or that are eligible for a mix or match case discount.